County Supervisor Steve Lavagnino noted the long, contentious battle to get here, but thanked owner Rick Caruso for delivering a result that was even better than what was promised. Rosewood President Radha Arora echoed Carney’s emphasis on the community, stating that all of its butlers are here to serve you — the community. Actor Rob Lowe reflected on the fond memories he has of the old Miramar and shared his excitement for the new one, noting that he can already feel the revitalizing effect the Miramar has had since the soft opening. Rick Caruso, CEO of Miramar’s owner/developer Caruso, took to the podium with Dodge, his golden retriever, at his side. Caruso recounted that the sometimes contentious development process — a 12-year love affair —was like all great love affairs — with days of great embrace and days of great reflection. He thanked the core group of community supporters who never gave up and gave him much strength. Caruso gave a special shout out to Lavagnino, his guiding light, who offered encouragement at tough moments and to Salud Carbajal, whom he called an absolute hero. In response to Lavagnino’s nod to the flying of the Italian flag, Caruso explained that it was his response to a law that limits flags to state and country ones, thereby prohibiting his preferred Rosewood flag. Caruso remarked on how the great recession lead to a beneficial pause in the development, because it allowed them to re-think plans and create what we now see, which is very different from the original intent. He closed by proclaiming his love for the community and that he will be a proud member of the community for a long time. 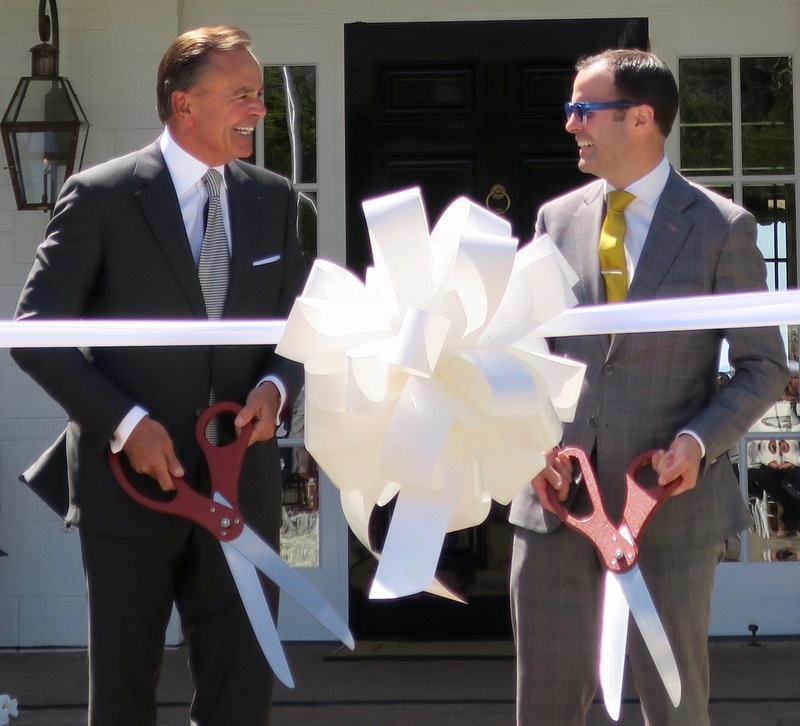 After the official ribbon cutting, the Manor House doors opened and guests strolled through to the Grand Lawn, upon which large white letters spelled out the event’s theme: “Welcome Home.” A lovely reception at the Miramar Beach Bar, at the water’s edge, followed. Caruso is a Los Angeles-based company with many high-end retail and residential developments. Rosewood operates 28 properties worldwide. Rosewood Miramar Beach has 161 rooms and suites and seven restaurants and bars on 16 acres. While the architecture and furnishings are refined and elegant, the feel is relaxed, comfortable, and welcoming, and the entire place is stunningly beautiful. Caruso created a gem for our community and the rest of the world. A fun-filled Easter weekend is planned for hotel guests and the community, including an interactive Easter egg hunt, bunny petting zoo, and beachside brunch. Next month, the Miramar will launch its Bocce League and host a Mother’s Day brunch and a Memorial Day weekend Burger Bash. More events for the community will follow. Photo: Gail ArnoldGuests are welcomed on the Grand Lawn.